The old Caswell County courthouse stands like a silent sentinel, overlooking the public square in Yanceyville. Built just prior to the Civil War by free and slave labor, the old structure has been the scene of many important and intriguing trials, and to most residents of Caswell County, stands as a reminder of the many-faceted history of Caswell. But, without the hard and fast work of a few courageous men in 1952, the old courthouse could have been lost forever, the victim of a flash fire! 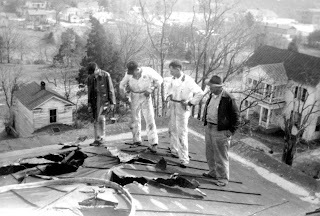 The morning of March 13, 1952 dawned cool and clear, and people went about their business in Yanceyville as usual, not suspecting that the day was going to be one for the history books. Around ten o'clock that morning someone spotted a small column of smoke drifting from under the eave of the courthouse, on the southeast corner of the roof. This small column soon turned into a billowing cloud of thick, dark smoke. A call was put in for the Yanceyville volunteer fire department, then the only such department in the county, and firemen soon arrived on the scene. An attempt was made to enter the attic of the courthouse through a doorway located at the top of the winding staircase in the front of the building, but without modern breathing apparatus, the firemen were forced back down. The fire department lacked ladders long enough to reach the roof of the courthouse, and for a while, it looked as if the building might be lost. Then, the heroes stepped forward. It was clear that a way had to be found to get to the roof of the courthouse. Lee Van Sykes, owner of Sykes-McAdams Electric Company in Yanceyville, thought of a way. Running to his store, he came back with a long ladder and began to lash it to the ladder provided by the fire department. With the two ladders tied firmly together, firemen stood outside on the ground holding a guy rope, while others held another guy rope from inside the courthouse. This way, the jury-rigged ladders could be set up against the building. The firemen began their courageous ascent to the roof, moving carefully up the rickety contraption. Sykes was the first to reach the roof, and was followed quickly by fireman Dorsey Bradner, carrying a fire hose. In quick order, other firemen ascended the ladder, until there were nine men standing atop the now red-hot roof. Axes were used to chop holes in the roof, and the massive job of putting out the fire began. Joining Sykes and Bradner were Foy Evans, Willie Lunsford, Hurley and Eugene Rudd, Roy Hodges, George Howard and Tom Buck. Using three 3-inch water hoses, the firemen pumped an estimated 30,000 gallons of water into the roof of the courthouse before the fire was brought under control. So much water was used in the fire fighting, that Yanceyville water superintendent, W. L. Gunn, said the town was left with just a quarter tank of water after the fire was put out. All the heroes weren't on the roof of the courthouse that day. 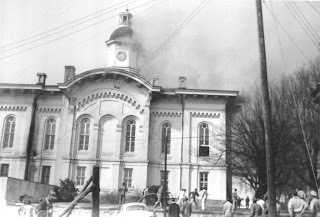 When the fire alarm rang out, a large crowd of spectators soon gathered, and began an evacuation of the courthouse, running back and forth into the building to carry out valuable court and county records before they were destroyed by the fire or by water damage. Repairs to the courthouse cost the county some $10,000, including repairs to the plaster that had fallen due to water damage. Although many risked their lives fighting the fire, and Caswell almost lost its most treasured historical building, at least two good results were noted after the burning. The county moved quickly to install a ladder on the east side of the courthouse, in order that access to the roof could be made in the event of another fire. The county also appropriated extra funds to the Yanceyville Sanitary District to enable that body to install a larger water main from the water supply lake, then under construction. The larger main, they noted, would provide more water for such emergencies. Today, the old courthouse bears few scars from its near-death some 31 years ago. But there are many who still remember the fire that turned local citizens into heroes for a day. Source: Durham, Joshua. "Courthouse Fire Made Many Heroes." The County Magazine March 1983: 16-17. Print. Guess What? The belfry/cupola of the Caswell County Courthouse is not original. It was destroyed by fire in 1916. "Caswell's Historic Court House Is Hit By Bolt"
For a while Friday afternoon the courthouse of Caswell county, at Yanceyville, was menaced with destruction by fire, which was started when a lightning bolt struck the pinnacle of the belfry. 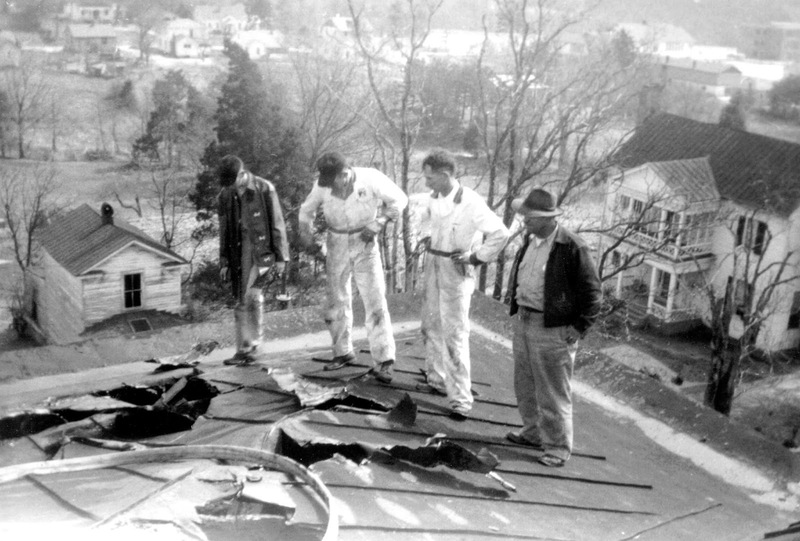 Happily the persistent efforts of Yanceyville citizens, who prize the substantial structure with a sentimental value which knows no computation, succeeded in quenching the flames with a bucket brigade. The belfry was ruined. The courthouse is heavily insured and there will be no monetary loss. An hour after the lightning struck the courthouse the Danville fire department was asked to make the 18-mile run with one of the automobile engines. Two large chemical extinguishers were sent, but the man carrying the extinguishers when about half way to the Caswell capitol was flagged down and told that the flames had been subdued. The bucket brigade had proved effective after strenuous efforts. At about 4:30 a heavy thunder story passed over Yanceyville, doing considerable damage. During its height, a thunderbolt struck the top of the courthouse and within a few minutes flames were seen to be emerging from the belfry which crowns the two-story, stuccoed brick building. For an hour the flames gradually gained and began to eat their way down towards the main building. While the fire was burning a corps of men began removing the furniture from the courthouse, also books and records of great value. The storm was one of particular violence, and several residences were struck by lightning and set on fire. Mrs. Cora Slade was knocked senseless by a bolt, but recovered consciousness some time later. Lightning set fire to a quantity of feed and tore some fences to pieces. The Reidsville Review (Reidsville, North Carolina), 12 September 1916, Tuesday, Page 1.